Democracy in America, part 4: What's wrong with the Supreme Court? Why the president and members of Congress are as fearful as they are now of criticizing a politicized Court which behaves as badly as this one does, is difficult to understand. American democracy has always been messy, rough and unruly. The political process has suffered under rampant manipulation, cheating and corruption. Even so, democracy has delivered and made America not only the world’s supreme power but also its lighthouse socially and culturally. Today, by common consensus, the American political system is dysfunctional and Washington bogged down in gridlock. This week's series of articles by Stein Ringen explores the state of democracy in America, covering gerrymandering and electoral fairness, presidential power and the use of signing statements, court activism and the Supreme Court, the incapacity of Congress, and the health of democracy overall. The argument of these articles is that the present predicament is new. Dysfunction strikes deeper than good old rough politics. It is not only a matter of disorder in Congress, the presidency and the Supreme Court. Beneath is a problem of power. The disorder that is visible in governance is a result of power being sucked out of the constitutional system and of a political culture that has abandoned inclusiveness and fairness. In a recent interview in London, Hillary Rodham Clinton said (in a matter of fact way), “our democracy is not working” (with Channel 4 News, on July 4 no less). If so, is the consequence not only dysfunction in Washington but also decline for America? The trouble with the Supreme Court is that it is too activist. The trouble with this is that it brings the powers in Washington out of balance with each other and wrecks a delicate system of checks-and-balances. The trouble with that, again, is that the constitutional system does not work as intended in the Constitution, indeed, as we now see in Washington, hardly works at all. Many observers believe that the strictures of the Constitution make serious constitutional reform prohibitively difficult, but this reticence is misplaced. It is true that it is difficult to change the Constitution, but the constitutional system works according to a range of conventions that are not prescribed in or protected by the Constitution and that could be changed easily if there was a will to do so. Court activism is one such convention. The Court is not at all as powerful as it has itself come to think and that others have come to believe. There is nothing in the Constitution to prevent Congress from restraining a Court that is out of control. Rather, up against a Court that takes on powers it should not have, the Constitution gives Congress a duty to restrain it. The Court has appellate jurisdiction “with such Exceptions, and under such Regulations as the Congress shall make” (Article III, Section 2). So the Constitution that gives the Supreme Court the job of guarding the lawmakers does not leave the guardian unguarded (as one would expect in a careful design of checks-and-balances). If the lawmakers should get their act together and decide it to be unacceptable that their powers are taken away from them, they would find that the Constitution gives them many instruments to reestablish balance. Congress would find a likely ally in the President, since court activism undermines his position as well. These two powers could then launch a campaign to restore checks-and-balances with a two-to-one majority. No Court would be able to stand up to such pressure, or even sustained pressure from Congress on its own. Congress and president could, firstly, put the Court under the moral pressure of well-argued criticism. President Franklin Roosevelt and his allies did that when they came into office and found the Court dead against their New Deal policies and dogmatically obstructive. In three years, by 1937, and before he was able to change its composition, Roosevelt had a compliant Court. Why the president and members of Congress are as fearful as they are now of criticizing a politicized Court which behaves as badly as this one does, is difficult to understand. Second, Congress could engage the Court by overruling its decisions in new legislation. This was another Roosevelt technique, and one that has been used by Congresses more assertive than the present one. The Civil Rights Act of 1991, for example, overturned nine Supreme Court decisions that had narrowed interpretation in previous law. After Citizens United, Congress should have started procedures to restitute its laws. The president can challenge the Court through his power of interpretation of Court rulings (as president Obama has done). Third, Congress could increase the number of justices. The number of nine is not written in stone and the Court has previously been both larger and smaller. The threat to ‘pack’ the Court was yet another Roosevelt technique. There are strong arguments for enlarging the Court. As it is now, too much power is vested in too few hands. That power should be diluted in a larger Court to assure more demanding judicial deliberation and decision making. Fourth, Congress could use its authority to introduce exceptions and regulations. It could, for example, appoint a tenth justice and impose a requirement of a majority of at least six for a ruling. There should be no more embarrassing 5-to-4 majority rulings in important constitutional matters. (In fact, a 5-to-4 ruling is a pretty sure sign that the Court is political rather than judicial and is deciding on a matter that should have been left for normal political resolution.) It could impose a majority rule for an appeal to be accepted for Court hearing (presently a minority of four is sufficient). Finally, Congress could deny the Court a budget or cut its budget. It is obliged to provide that justices are paid but not to increase their compensation beyond where it stands, nor to pay justices a salary for life on retirement, or any other pension for that matter, nor to fund the Court’s lavish administration. A full-blown confrontation between Congress and the Court is unlikely, but that is not because the Constitution ties Congress’s hands and makes the Court all-powerful. It is also unnecessary. If Congress would only reassert itself, it could easily put enough fear into the Court to deflate its exaggerated view of itself and get it into line. Samuel Chase, painted by John Beale Bordley (1800-1882). Wikimedia/Public domain.The extreme and exceptional weapon in the hands of Congress is the threat of impeachment. Congress has the power to remove civil officers of the government for “high Crimes and Misdemeanors.” That includes judges of lower courts and justices of the Supreme Court. A number of judges have been removed from office by impeachment, the last case being in 2010. 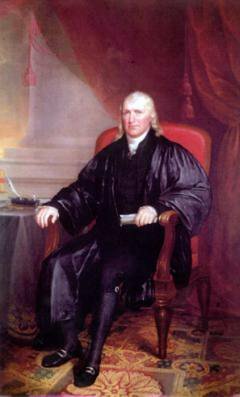 The only Supreme Court justice to have been impeached was justice Samuel Chase in 1804, on a range of charges including “political bias” and “intemperate, unbecoming, unwarrantable and indecent” remarks and behaviour. Justice Chase was acquitted. Since this case, it has been considered that quality of judgement is not a cause of impeachment, but legal or ethical misconduct does remain just cause. Justices of the Supreme Court have security of tenure “during good behavior.” Grounds for impeachment would then be legal or ethical misconduct in breach of good behaviour serious enough to constitute “high crimes or misdemeanours.” That sets a high bar but not an impossible one. For one thing, it does not limit the grounds of impeachment to criminal offences. Impeachment would require Congress (the House of Representatives) to identify one (or more) of the nine justices as being in breach of what should be required as good ethical behaviour (setting aside criminal offences). 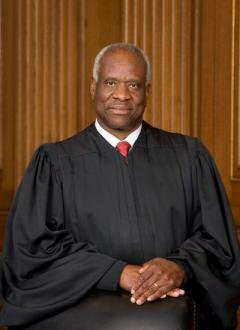 The potential candidate among the present justices is Clarence Thomas. The grounds on which he could be impeached is conduct in office that is unbecoming of a Supreme Court justice and that represents a contempt of the Court and of the constitutional and democratic system. There are various grounds for criticism of Justice Thomas’s performance. - His rulings are said, by broad judicial agreement, to tend to the eccentric, unpredictable and original in the sense of displaying apparently novel and surprising legal theory. He seems to have been less successful than other justices in getting his colleagues in the Court to agree with him. Whether true or not, however, this would not be a cause for impeachment. - He has tended to frame his opinions in legalistic and technical jargon ill suited for comprehension or enlightenment outside of the courtroom, or even within it, and has been unwilling to engage in serious deliberation on or explanation of his opinions. That also would hardly be cause for putting him on trial, but is starting to look like badish behaviour. Clarence Thomas. Steve Petteway/Wikimedia. Public domain.When the Court hears a case, both parties, the petitioner and the respondent, prepare briefs in which they lay out their views on the case, and usually additional briefs of comment on each other’s interpretations and opinions. The next round is usually for the Court to hear oral arguments. Here, lawyers for each party have an opportunity to explain their positions further and justices to put questions to them that have arisen from their readings of the briefs. Usually, questions and answers take up most of the time. This serves to clarify the matter in the minds of the justices, to allow them to test the views they have come to from the briefs, and to alert each other of their interpretations. These sessions are open to the public, as other proceedings of the Court are not, and are an important arena in which the Court informs society about its work. Most of the justices are eager to engage in oral exchange, but justice Thomas has for more than eight years not participated with a single question during oral arguments. That silence, it could be argued, is bad behaviour. It represents a refusal to engage publicly with respect to Court work. It also represents a refusal on the part of this justice to subject his own opinions to testing in front of his colleagues and the public. The Court makes important decisions. Citizens want to be reassured that they do that carefully and thoughtfully and that they work earnestly with all the means available to them to thrash out solid legal rulings in the cases they consider. It could be argued, in the spirit of modern and open democracy, that a man who accepts the power held by a justice of the Supreme Court and who delights in its use, has a duty to engage with and educate the public on his exercise of that privilege. The Court has decided that oral hearings are a necessary procedure in its work and that reasonable participation in this as in other procedures is a duty. It could be argued that a justice has a duty to hone his own opinions with the help of the instruments provided by Court procedures. It could be argued that the refusal to so engage, both inside and outside of the Court, which is unusual among justices, represents a contempt both of the Court and of the broader democratic system that falls short of good behaviour on the part of a person in a position of high authority. It could be argued, as has for example the New Yorker, that in his behaviour in these matters, justice Thomas is simply not doing his job. An impeachment on these terms might seem unlikely, and might seem unlikely to succeed even if launched. However, if Congress wanted a show-down with the Court in order to restore the Constitutional intention of checks-and-balances, impeachment is a weapon available to it. In what might be seen by Congress as a necessary confrontation, the threat of impeachment is not necessarily wasted even if actual impeachment does not follow. Nor is an unsuccessful impeachment necessarily wasted. The impeachment of justice Chase helped, among other things, to clarify the notion of judicial independence (although that was not what the impeachers intended). US midterms - democracy in America?